What is the best drum sander on the market today? Like any good tool there are a wide range of brands adding their products into the mix. Knowing which to go for can be difficult. That’s where this guide aims to help. We’ve taken 5 top rated drum sanders and delved deep to give you an in depth analysis of each. For our findings at a glance, just head to the table below. 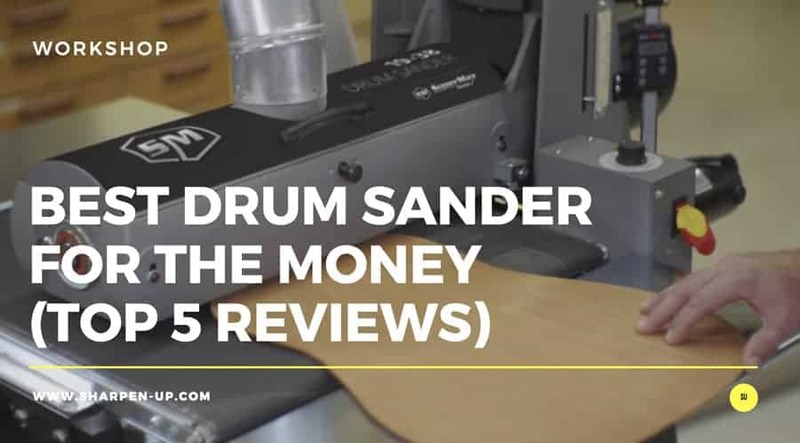 For detailed reviews on each of our picks, plus a dedicated drum sander buyer’s guide, keep on reading. 12 1/4" by 25 1/2"
In our top 5 review round up, we have carefully selected a range of drum sanders to suit different needs and budget. Here follows a comprehensive analysis and comparison of each of our choices. 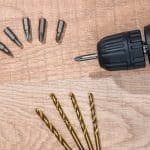 The 723520K by Jet Tools is our number one pick for good reason. 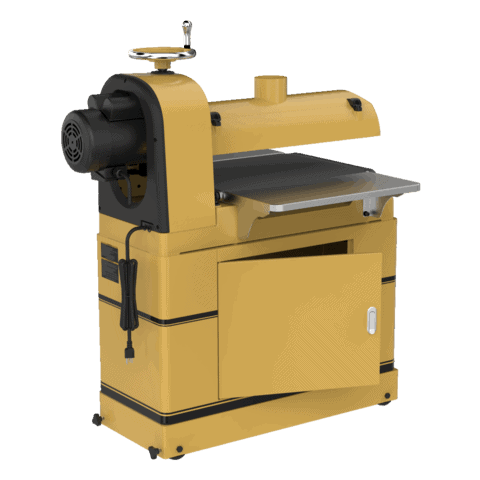 Firstly, this is a quality built, open-end single-drum sander that uses a unique tool-less parallelism system for adjustment so that a 16-inch wide workpiece can be sanded in a single pass. The all important drum is powered by a 1.5-horsepower (HP) motor, which alongside the variable-speed slow-spinning motor allows the worker to achieve a high-quality finish on hardwoods. The average weight of the Jet 723520K JWDS-1632 is 156 pounds; and it is 40 inches long and 27 inches wide, while its average height is 48 inches. These dimensions attests to its compact design, as well as good size-to-weight ratio which allows this drum sander to be carried around the workplace, even along stairs. Its stand (which is included in this particular package) is shaped like an open trapezoidal prism with the base larger than the top. This gives the stand stability, as well as ensures that it can smoothly absorb the vibrations generated by the drum sander while it is running. The cantilever design of the drum allows its 1.5-HP motor to be placed directly on the side of the drum sander. The length of the drum is 16 inches while the diameter is 5 inches. The electric motor can spin the drum at a maximum speed of 1720 rpm. This model comes with a patented SandSmart control mechanism that serves to continuously monitor the amount of load that the drum motor encounters, and then automatically regulate the conveyor motor speed so as to ensure that the workpiece is fed onto the drum at an optimized feed rate. This ultimately eliminates the risk of overload. The drum fitted on the to the machine also allows for an extra-fine (grit) sandpaper to be used. Equally, the cantilever design of the die-cast drum carriage gives it rigidity which allows it to maintain a consistent position and durable orientation for longer than standard drum sanders. The top part of the drum carriage (encasement) is the dust collection hood, and its interior design features an integrated channel whose shape mirror the drum shape, hence allowing chips and dust flying off the drum to be channeled through the hood to a 4-inch dust-collection port. The dust collection system of this model can achieve a dust collection volume of 400 cubic-feet-per-minute (CFM) and higher. The sandpapers (abrasives) are secured onto the drum using toolless take-up clips. The use of these clips makes it easy for one to change abrasives when necessary. 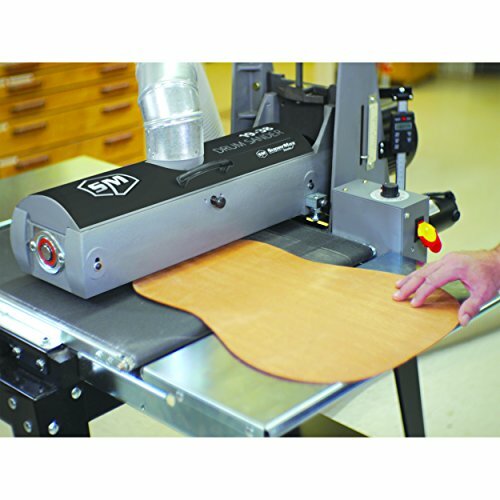 Another unique feature of this drum sander is its adjustable tension (or pressure) rollers which apply a pre-determined downward pressure on the workpiece hence preventing snipes from coming off the wood-piece. The drum can also be removed, and serviced with relative ease. This drum spins on a hub that is runs on permanently-lubricated and sealed ball bearings. Each of these ball bearings has a diameter of one inch, and they are designed for durability. There are independent controls for the drum motor and conveyor motor, and this allows the performance of either motor to be optimized in relation to the other motor. Likewise, the conveyor belt features a proprietary adjustment system called Trackers, which minimize the need for manually adjusting the belt. The 1.5-HP electric motor is a 14-amperes single-phase motor powered by 115 volts. Meanwhile, the conveyor motor is a direct-drive DC (direct current) motor capable of generating a torque of 43 pounds-per-square-inch. There is a variable speed control mechanism that regulates the speed of feed rate achieved by this conveyor motor. The feed rate speed ranges from 0 to 10 feet-per-minute (FPM), and the worker can adjust the optimal feed rate using the variable speed control dial. The variable-speed control knob, along with an integrated on-off switch, are conveniently positioned for easy access and use. The recommended circuit amperage for this model of drum sander is 20 amperes as this is enough to power both the drum motor and the conveyor belt motor, without either motor receiving inadequate current when both are running concurrently. The conveyor bed of this model is a precision-flattened reinforced steel worktable. Its conveyor system operates to pull the wood-piece through the drum sander. Generally, before starting to operate this drum model, it is necessary to ensure that the worktable, which also serves as the conveyor bed, is exactly parallel to the drum as this ensures that the workpiece is sanded along a straight path that is parallel to the edges of the workpiece, besides reducing the risk of the workpiece sliding off the worktable. In this model, the parallelism dial allows one to easily achieve conveyor bed parallelism. This parallelism adjustment dial also has a Stop feature which is used to adjust the conveyor bed to a completely flat position. The conveyor belt can be easily changed just be engaging or disengaging the spring clip that secures it onto the conveyor bed. The aluminum drum of this model is precision-machined and is set to be dynamically-balanced during operations. This allows the drum to easily dissipate heat hence preventing heat damage on the wood surface. The drum height (that is, distance between the lowest part of the drum and the topmost surface of the conveyor bed) is adjustable. The top-position hand-wheel is used for this height adjustment, and for each complete rotation of the hand-wheel, the height is adjusted by 1/16 inches; and by using the relative-depth scale of this hand-wheel, once can easily and precisely adjust the drum height. The maximum thickness of a wood board that can be worked on using this model is 3 inches, while the minimum thickness is 1/32 inches. The maximum board width that can be sanded is 32 inches, with the complete sanding being achieved after 2 passes. The minimum wood-board length that can worked on is 2-3/8 inches. This model comes with a 5-year warranty provided by Jet Tools under its Jet Red Assurance scheme. 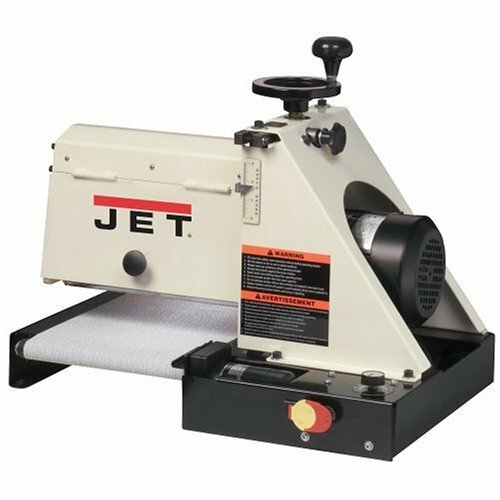 This quality assurance scheme allows a damaged drum sander to be repaired, or even be serviced, at any of the authorized service centers run by Jet Tools. This model comes alongside the sander, abrasives set, and stand. Can work with workpieces whose width is less than 32 inches. Robust and durable metal construction. Easy-to-use Spring clip allows for conveyor belt to be changed easily. 1.5 HP drum motor achieves high drum speeds of 1720rpm. Independent control mechanisms for both drum motor and conveyor motor. Benefits from a 60-months warranty. Can only work well with minimum current supply of 20A. Trackers of conveyor belt limits the degree of adjustment that one can achieve. Cannot work on workpieces that are thicker than 3 inches. 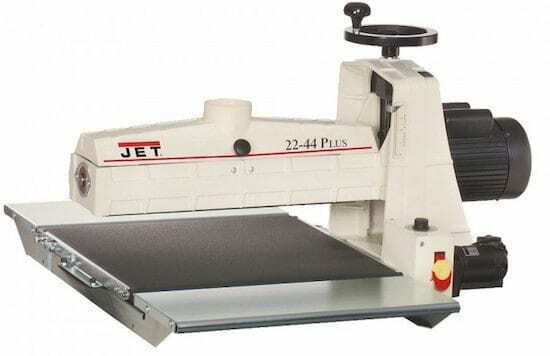 The Jet 723520K JWDS-1632 is an open-end single-drum sander that uses a unique tool-less parallelism system for conveyor bed adjustment so that a 16-inch wide workpiece can be sanded in a single pass, while a 32-inch wide workpiece can be fully sanded in 2 passes. Its worktable can be positioned precisely using a parallelism dial, while the drum height can be precisely adjusted; while its drum that is powered by a 1.5-horsepower (HP) motor, works in concert with a conveyor belt powered by a variable-speed slow-spinning motor to enable a worker achieve a high-quality finish on hardwoods. 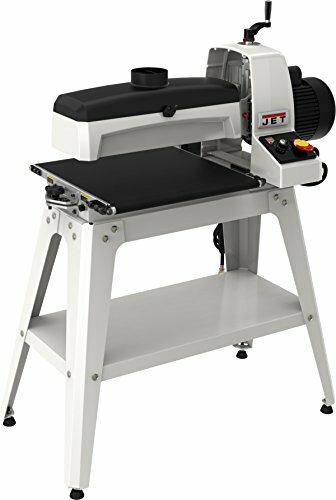 The unmatched cost-performance profile, exceptional quality, good size-weight ratio, and extremely convenient features such as a dust collecting mechanism, use of independent switches, and support for extension tables makes (in our opinion) the Jet 723520K JWDS-1632 the best drum sander on the market today. 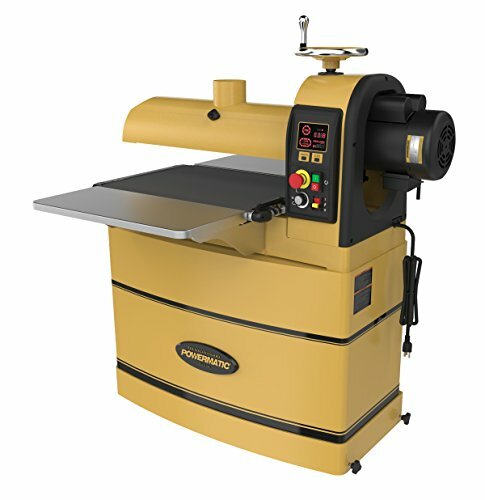 The 19-38 is a high-quality open-end single-drum sander that rests on a steady open steel stand, and powered by AC (alternating current). 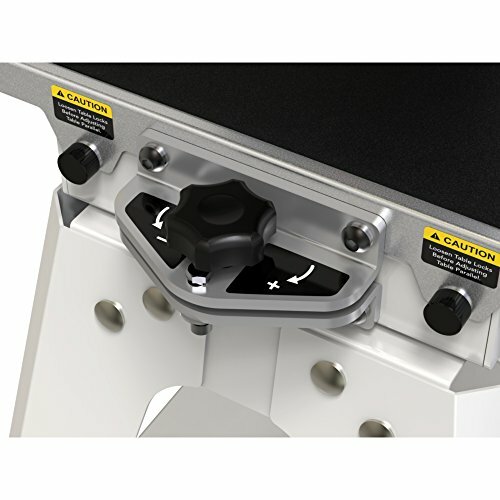 It features a simple-alignment mechanism that allows the user to align the conveyor bed parallel to the drum by just rotating a conveniently-positioned adjustment knob. Likewise, its patented Intellisand Technology allows for the conveyor speed to be adjusted based on workload. Its robust open-end design allows for a 19-inch wide workpiece to be sanded in a single pass, and for a 38-inch wide workpiece to be smoothed in two passes. This drum sander is built by SuperMax Tools. The average weight of the SuperMax 71938-D is 305 pounds; and it is 57.6 inches long and 41.8 inches wide, while its average height is 57.6 inches. Its size dimensions show that it is larger than the Jet 723520K, even though the weight-to-size ratio of the SuperMax 71938-D is still compact. That being said, the SuperMax is heavy, and cannot be easily moved around the workplace without the use of special lifting equipment. Just like the Jet 723520K the steel stand of the 71938-D has an open design with its shape being a trapezoidal prism with the base larger than the top. This gives the stand stability, as well as ensures that it can smoothly absorb the vibrations generated by the drum sander when it is running. The cantilever design of the drum allows its 1.75-HP motor to be placed directly on the side of the drum sander. The length of the drum is 19 inches while diameter is 5 inches. The electric motor can spin the drum at a maximum speed of 1740 rpm. Equally, the cantilever design of the heavy-duty cast-iron drum carriage gives it rigidity and stability, as well as makes it durable for work. The dust collection hood is located at the top-section of the drum encasement, and its dust cover mirrors the drum shape, hence allowing chips and dust flying off the drum to be channeled through the hood to a 4-inch dust-collection port. The dust collection system of this model can achieve a dust collection volume of 600 cubic-feet-per-minute (CFM) and higher. The sandpaper (abrasives) are secured onto the drum using clips, which can be easily disengaged so that the sandpaper can be changed. This drum sander also uses adjustable tension/pressure rollers to apply a pre-determined downward pressure on the workpiece hence preventing snipes from coming off the wood-piece. As you would expect, the drum can be easily removed for servicing. There are independent controls for the drum motor and conveyor motor, and this allows the performance of the motor to be individually optimized as necessary. Likewise, the conveyor belt features a proprietary adjustment system that minimize the need for manually adjusting the belt. The conveyor table of this model is 22 inches wide, which makes it 3 inches wider than the drum width. It also allows the conveyor bed to easily accommodate workpiece whose width exceeds 19 inches. The 1.75-HP electric motor is a 15-amperes single-phase motor powered by 110 volts. Meanwhile, the conveyor motor is a direct-drive DC motor capable of generating a torque of 43 pounds-per-square-inch. The feed rate speed ranges from 0 to 10 FPM, and the worker can adjust the optimal feed rate using the variable speed control dial. The variable-speed control knob, along with an integrated on-off switch, are conveniently positioned for easy access and use. This conveyor bed of the SuperMax 71938-D is a precision-flattened reinforced worktable, and its conveyor system operates by pulling (not pushing) the wood-piece through the drum sander. The worktable needs to be parallel to the drum as this ensures that the workpiece is sanded along a straight path, which is parallel to the edges of the workpiece; besides reducing the risk of the workpiece sliding off the worktable. In this model, a well-positioned easy-to-use dial allows one to easily achieve conveyor bed parallelism. Likewise, the conveyor bed can be set to a completely flat position. The drum of the 71938-D is precision-machined, and set to be dynamically-balanced during operations. This allows the drum to easily dissipate heat hence preventing heat damage on the wood surface. The drum height is adjustable using a well-positioned hand-wheel. The maximum thickness of a wood board that can be worked on using this model is 4 inches, while the minimum thickness is 1/32 inches. The maximum board width that can be sanded is 38 inches, with the complete sanding being achieved after 2 passes. The minimum wood-board length that can worked on is 2-1/4 inches. Can work with workpieces whose width does not exceed 38 inches. Can handle workpieces whose thickness does not exceed 4 inches. 1.75 HP drum motor achieves high drum speeds of 1740rpm. Cannot work on workpieces that are thicker than 4 inches. 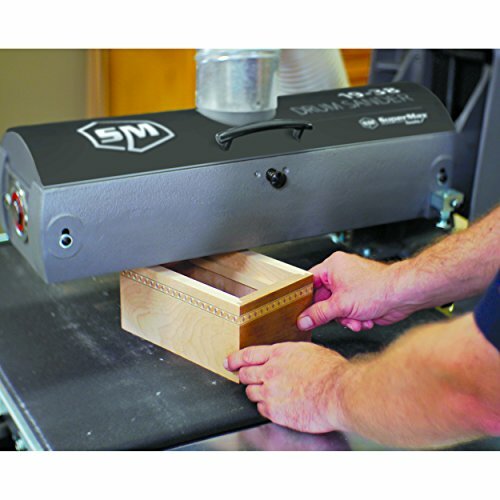 The SuperMax 71938-D is a precision-machined and high-quality open-end single-drum sander that rests on a steady open-frame steel stand, and is powered by 110volts, 15 amp AC power. Its simple-alignment mechanism adjusts conveyor bed parallelism, while its patented Intellisand Technology allows for the conveyor speed to be adjusted based on workload. It can work on a 19-inch wide workpiece in a single pass, and a 38-inch wide workpiece in two passes. Altogether a highly recommended option. 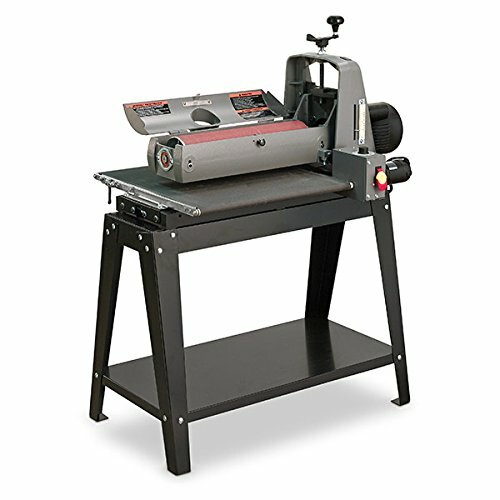 This is a high-quality open-end single-drum sander that features an integrated design with its integrated LED-equipped control panel indicating the precise belt speed and power. Additionally, its in-built feed logic enables it to achieve a precisely-set finish while eliminating the risk of overload. The innovative cantilever open-end design of its drum allows for a 22-inch wide workpiece to be sanded in a single pass, and for a 44-inch wide workpiece to be smoothed in two passes. This robust, industrial style drum sander is built by Powermatic. The average weight of the PM2244 is 418 pounds; and it is 45.6 inches long and 23 inches wide, while its average height is 50.3 inches. Its size dimensions give it a lean and tall design. Even so, it is heavier and bigger than either the Jet or the SuperMax reviewed above. As can be expected, the Powermatic PM224 is on the heavy side, and can only be moved around using special lifting equipment. Unlike the Jet 723520K or the 71938-D, the stand of the PM224 features a closed robust design. This robust closed design allows this stand to efficiently carry the heavy drum sander, as well as provide ample stability, while smoothly absorbing vibrations generated by the drum sander when it is running. The cantilever design of the drum carriage allows a 1.5-HP motor to be placed directly on the side of the drum sander. The length of the drum is 22 inches while diameter is 5 inches. The electric motor can spin the drum at a maximum speed of 1720 rpm. This model comes with a patented control mechanism that ensures that a workpiece is fed onto the drum at an optimized feed rate, hence diminishing the risk of overload. Similarly, the cantilever design of the die-cast drum carriage gives it rigidity which allows it to maintain a constant position. The dust collection hood is placed at the top section of the drum carriage, and its design closely mirrors the drum shape, hence allowing chips and dust flying off the drum to be channeled through the hood to a 4-inch dust-collection port. The dust collection system of this model can achieve a dust collection volume of 800 cubic-feet-per-minute (CFM) and higher. The sandpaper is well- secured onto the drum, and it can be replaced easily. The adjustable pressure rollers of the Powermatic PM224 allow pre-determined downward pressures to be applied on the workpiece hence preventing snipes from coming off the wood-piece. The drum can be removed and serviced of course. There are independent controls for the drum motor and conveyor motor. Also, the conveyor belt features an adjustment system that reduces the need for manual adjustment of the conveyor belt. This model comes with infeed and outfeed tables which provide an additional length support of 37.5 inches. The 1.75-HP electric motor is a 14-amperes single-phase motor powered by 115 volts. Meanwhile, the conveyor motor is a direct-drive DC motor capable of generating a torque of 43 pounds-per-square-inch. There is a variable speed control mechanism that regulates the speed of feed rate achieved by this conveyor motor. The feed rate speed ranges from 0 to 10 FPM. The recommended circuit amperage for this model of drum sander is 20 amperes as this is enough to power both the drum motor and the conveyor belt motor. The conveyor bed of the PM224 is a precision-flattened reinforced worktable, and its conveyor system operates by pulling the wood-piece through the drum sander. The worktable needs to be parallel to the drum. The sander also has a well-positioned easy-to-use dial that allows one to easily achieve conveyor bed parallelism. Furthermore, the conveyor bed can be set to a completely flat position. The drum of the Powermatic PM224 is precision-machined, and set to be dynamically-balanced during operations. This allows the drum to easily dissipate heat and avoid burning the wood surface. The drum height is adjustable using a well-positioned hand-wheel. The maximum thickness of a wood board that can be worked on using the PM224 is 4 inches, while the minimum thickness is 1/32 inches. The maximum board width that can be sanded is 44 inches, with the complete sanding being achieved after 2 passes. The minimum wood-board length that can worked on is 2-3/8 inches. Powermatic PM224 comes with a 5-year warranty. Can work with workpieces whose width does not exceed 44 inches. Its in-built feed logic enables it outstanding finish. 1.75 HP drum motor achieves high drum speeds of 1720rpm. 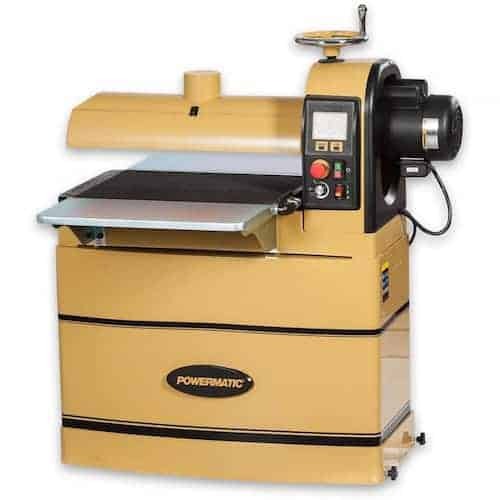 The Powermatic PM2244 is a high-quality, heavy-duty, and open-end single-drum sander that features an integrated design whose integrated LED-equipped control panel shows precise belt speed and power. Also, its well-integrated inbuilt feed logic allows for a precisely wood finish to be achieved while eliminating the risk of overload. Moreover, the innovative cantilever open-end design of its drum allows for a 22-inch wide workpiece to be sanded in a single pass, and for a 44-inch wide workpiece to be handled in two passes. Need we say more? 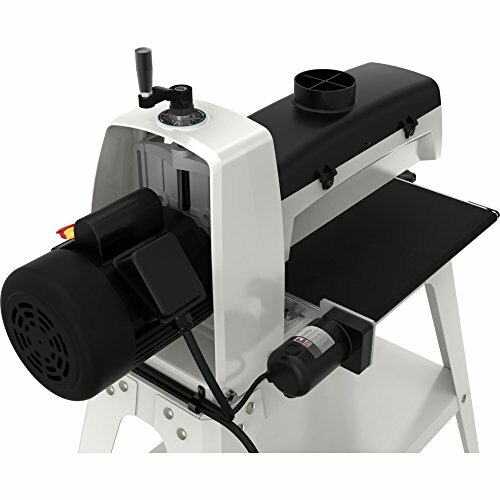 This is another high-quality, minimalist-design and compact drum sander whose drum is 10 inches wide, and is powered by a 1-HP 115-volts single phase motor. 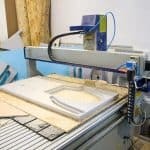 It uses a unique tool-less parallelism system for adjustment so that a 10-inch wide workpiece can be sanded in a single pass, while a 20-inch wide workpiece can be operated in 2 passes. The average weight of the JET 628900 is 96 pounds; and it is 27 inches long and 20 inches wide, while its average height is 20 inches. Its size dimensions makes it a miniature version of the Jet 723520K. Its also attests to the compact design and good size-to-weight ratio of the machine, which allows it to be carried around the workplace, even along stairs. Its stand features an open design, and is shaped like an open trapezoidal prism with the base larger than the top. 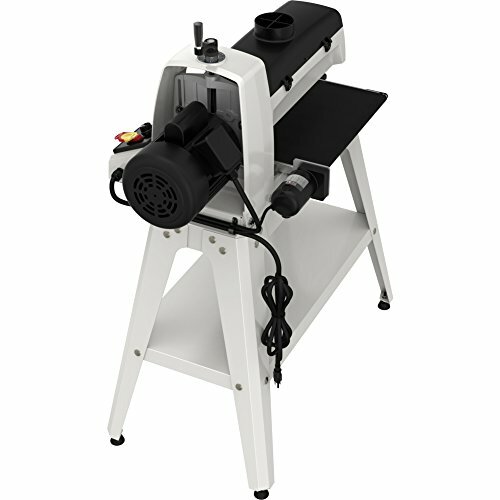 This gives the stand stability, as well as ensures that it can smoothly absorb the vibrations generated by the drum sander when it is running. The cantilever design of the drum allows its 1-HP motor to be placed directly on the side of the drum sander. The length of the drum is 10 inches while diameter is 5 inches. The electric motor can spin the drum at a maximum speed of 1700 rpm. This model comes with a patented SandSmart control mechanism that serves to continuously monitor the amount of load that the drum motor encounters, as well as automatically regulates the conveyor motor speed so as to ensure that the workpiece is fed onto the drum at an optimized feed rate. This minimizes the risk of overload. The cantilever design of the die-cast drum carriage gives it rigidity and stability. Unlike the Jet 723520K, the 628900 does not have its dust-collecting hood fitted onto the drum carriage. This hood needs to be fitted separately and attached to a 4-inch dust-collection port fitted on the drum carriage. The sandpapers are secured onto the drum using toolless take-up clips, which allows them to be easily changed as required. The use of adjustable tension rollers allows for pre-determined downward pressure to be applied on the workpiece hence preventing snipes from coming off the wood-piece. The drum can be removed, and serviced. This drum spins on a hub that is runs on permanently-lubricated and sealed ball bearings. There are independent controls for the drum motor and conveyor motor, and this allows the performance of either motor to be optimized. Also, the conveyor belt features the proprietary Trackers adjustment system that minimizes the need for manually adjusting the belt. The 1-HP electric motor is a 7-amperes single-phase motor powered by 115 volts. Meanwhile, the conveyor motor is a direct-drive DC motor capable of generating a torque of 43 pounds-per-square-inch. The feed rate of this model ranges from 0 to 10 FPM. Its variable-speed control knob, along with an integrated on-off switch, are conveniently positioned for easy access and use. The conveyor bed of the Jet 628900 is a precision-flattened reinforced steel worktable. Its conveyor system operates to pull the wood-piece through the drum sander. The aluminum drum of this model is precision-machined and set to be dynamically-balanced during operations hence allowing to easily dissipate heat and reducing the risk of wood damage. The drum height of this model is adjustable. 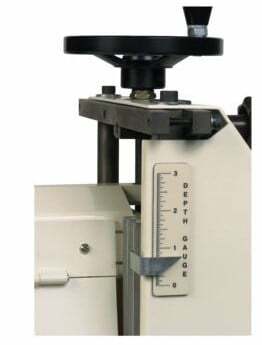 The top-position hand-wheel is used for this height adjustment, alongside its relative-depth scale. The maximum board width that can be sanded is 20 inches, with the complete sanding being achieved after 2 passes. The minimum wood-board length that can worked on is 2-1/4 inches. This model comes with a 5-year warranty provided by Jet Tools under its Jet Red Assurance scheme. This quality assurance scheme allows a drum sander to be repaired, or serviced, at any of the authorized service centers run by Jet Tools. Can work with standard 20-inch workpiece. 1.0 HP drum motor achieves high drum speeds of 1700rpm. Cannot work on workpieces whose width exceed 20 inches. Lacks a dedicated dust collection system. 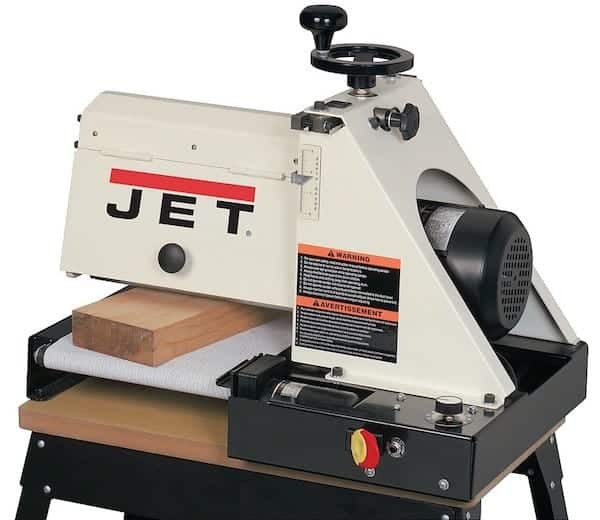 The Jet 628900 is a high-quality, compactly-designed drum sander that can handle 10-inch wide workpiece is a single pass, and 20 inches wide workpieces in two passes. 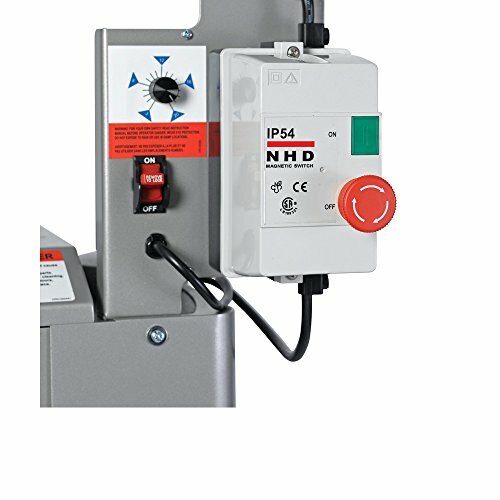 This affordable model is powered by a 1-HP 115-volts single phase motor. This is a high-quality dual-drum sander whose 26-inch drums are powered by a 230-volts, 3-HP motor. Its closed-end drum design allows for the front drum to be raised slightly higher than the back drum. 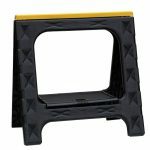 Its heavy-duty steel frame and robust stand allows it to handle heavy-duty or industrial-grade wood sanding. The maximum width of workpiece that can be worked on is 26 inches. This model is built by the Delta Power-Equipment Corporation. The average weight of the 31-481 is 530 pounds; and it is 53 inches long and 31 inches wide, while its average height is 46 inches. Its size dimensions give it a sturdy design, with its large rectangular base supporting a lean and tall machine. Even so, it is heavier and bigger than the other drum sanders reviewed above. However, the weight-to-size ratio of the Delta Woodworking 31-481 suggests that it has a minimalist design, even though it is quite heavy, and can only be moved around using special lifting equipment. The stand of the Delta Woodworking 31-481 features a closed robust design. This robust closed design allows this stand to efficiently carry the heavy drum sander, as well as provide ample stability, while smoothly absorbing vibrations generated by the drum sander when it is running. The color scheme of this model is silver-grey. A 3-HP motor powers the two drums in the 31-481, and this motor is located in the body of the drum sander, and not on its side as is the case with the single-drum sanders reviewed above. The two drums are of equal size, and the length of each is 26 inches while the diameter is 5 inches. The electric motor can spin each drum at a maximum speed of 1550 rpm. There are 2 dust collection hoods that are placed at the top section of the drum carriage of each drum. The design of the hoods closely mirror their respective drum shape, hence allowing chips and dust flying off the drum to be channeled through the hoods to the 4-inch dust-collection port of each hood. The dust collection system of this model can achieve a dust collection volume of 600 CFM per each hood. The sandpaper is well- secured onto each drum, and can be replaced easily. 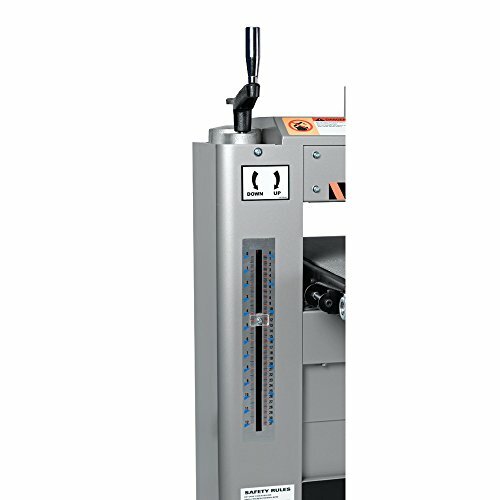 The adjustable pressure rollers of the Delta Woodworking 31-481 allow pre-determined downward pressures to be applied by each drum onto the workpiece hence preventing snipes from coming off the wood-piece. Either of the two drums can be removed and serviced. There are independent controls for the drum motor and conveyor motor. Also, the conveyor belt features an adjustment system that reduces the need for manual adjustment of the conveyor belt. The 3-HP electric motor is a single-phase motor powered by 115 volts, 60 Hz AC power. Meanwhile, the conveyor motor is a an generate considerable torque. There is a variable speed control mechanism that regulates the speed of feed rate achieved by this conveyor motor. The feed rate speed ranges from 3 to 20 FPM. This conveyor bed of the Delta is a precision-flattened reinforced worktable, and its conveyor system operates by pulling the wood-piece through the drum sander. The drum height is adjustable for either of the two drums, and this gives this drum sander model an exceptionally high capacity that allows for workpieces to be sanded up-to a depth of 12.25 inches. The recommended maximum width of the workpiece is set at 25.5 inches, but a 26-inch wide workpiece can still be worked on using this drum sander. The minimum thickness for this model is 1/4 inches. 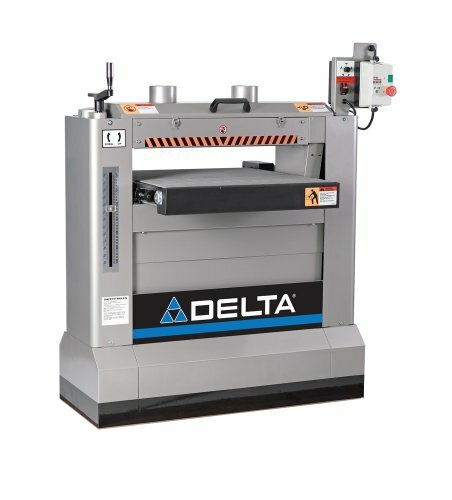 The Delta Woodworking 31-481 comes with a 5-year warranty. Uses two drums for sanding. Can sand workpieces to a considerable depth. Can produce outstanding wood finish. Can handle workpieces whose thickness exceed 4 inches. 3 HP drum motor achieves high drum speeds of 1550rpm for each of the 2 drums. Cannot work on workpieces whose width exceed 26 inches. The Delta Woodworking 31-481 is a high-quality and heavy-duty dual-drum sander whose 26-inch drums are powered by a 230-volts, 3-HP motor. Its closed-end drum design allows for the front drum to be raised slightly higher than the back drum, and its heavy-duty steel frame and robust stand allows it to handle heavy-duty or industrial-grade wood sanding. 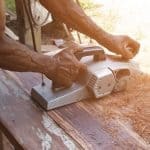 What is a drum sander? The drum sander is a professionally-designed power tool that is used for sanding woodwork and wood-pieces. 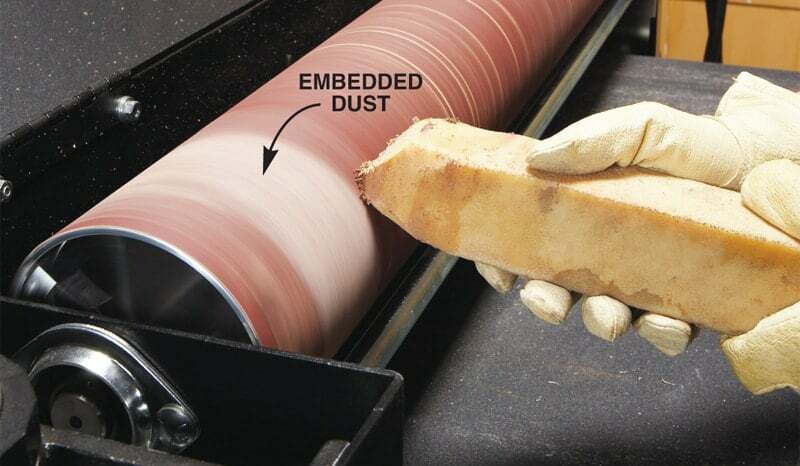 The sanding process uses sandpaper to provide abrasion that smoothen a workpiece. The sandpaper is fitted onto a rotating drum, and this causes it to spin at a high speed which allows it to quickly sand the workpiece, as well as even its surfaces so that perfect square edges are cut into the workpiece. 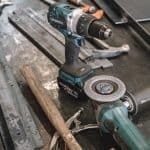 This electrically-powered power tool is relatively large and this allows it to work efficiently and rapidly on several workpieces, while maintaining precision of the sanding process. Also, because the hands of the worker are free, they can use them to control the operations of the drum sander, as well as orient the direction and tilt of the workpiece so that smooth angled edges can be achieved. Drum sanders do produce fine dust during their operation, and this necessitates them to have a working dust collection system. Normally, most use a suction mechanism to pull dust off the workpiece, hence leaving behind a well-sanded workpiece that can be easily cleaned. This suction mechanism is housed inside the box that encases the drum. At its basic level, the drum sander is an automated planer that uses sandpaper to smoothen a wooden surface. 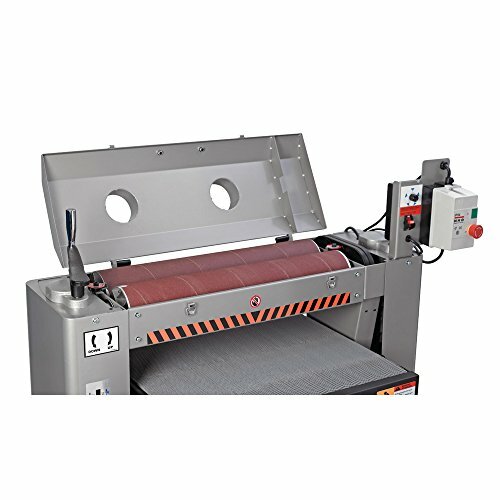 The key parts of the drum sander are the drum, the drum-rotating motor, a non-slip conveyor belt, and the slow-speed motor that drives the conveyor belt. As mentioned earlier, this sandpaper is wrapped or rolled onto a drum like a cover reel. To ensure that the sandpaper does not fly off when the drum is spinning, there are two attachment points that securely affix the sandpaper to the drum. This ensures that the sandpaper spins at the same speed as the drum. The drum is rotated by an electric motor attached to its side. 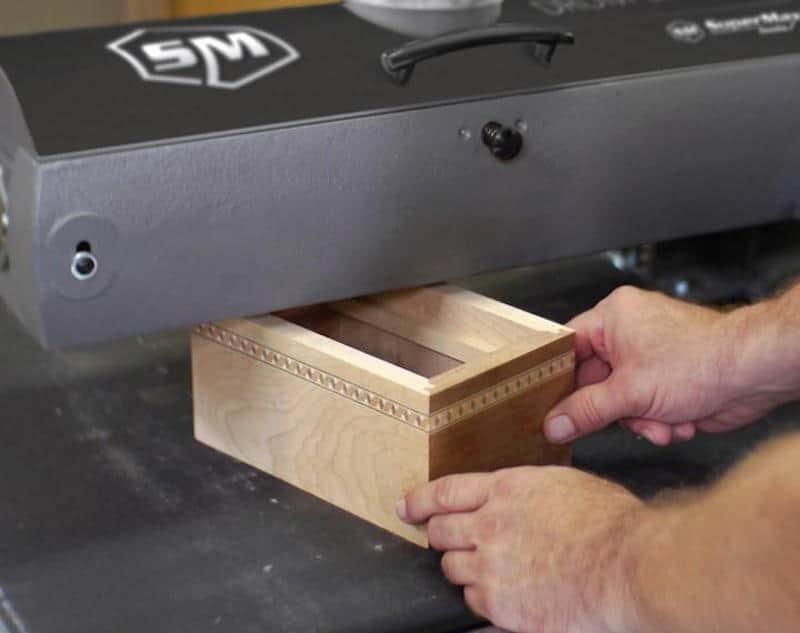 The sandpaper, drum and its motor are housed inside an open box that is open at the bottom, which allows the sandpaper to come into contact with the workpiece. The drum spinning speed can reach 1800 revolutions-per-minute (rpm), and this high-speed can cause the attached sandpaper to abrade deep into the workpiece. To avoid this, only a small portion of the sandpaper comes in contact with the wood, which is atop a motorized conveyor belt. This conveyor belt is powered by a slow-spinning motor which allows it to move the workpiece at a slow regulated pace across the drum. The sandpaper used needs to suit the intended purpose, and for this reason, one needs to use a sandpaper of the right grit, choosing from coarse, medium, and fine grit. The quick-change system of a drum sander allows for the right sandpaper roll to be installed or fitted onto the drum. Inside the drum are two pressure rollers that allow the drum to press the workpiece against the conveyor belt. The performance of a drum sander is determined by the type, quality, and design of drums, conveyor belts, and grit of sandpaper used; as well as the ability to fine tune the operations of the motors along with the pressure rollers that determine not only the pressure that the drum exerts onto the workpiece, but also how much high the drum is top surface of the workpiece. The width of the drum and conveyor belt is also important as it determines the size of the workpiece that can be sanded using the drum sander. There are two basic types of drums; the open-end single-drum and the double drum. The open-end drum sander can work on a wood-piece whose width is twice the width of the drum. The double-drum sander has two drums arranged one in front of the other, with the front drum being placed slightly higher from the conveyor belt as compared to the back drum. Sharpen-up.com is a participant in the Amazon Services LLC Associates Program, an affiliate advertising program designed to provide a means for sites to earn advertising fees by advertising and linking to Amazon.com. *Amazon and the Amazon logo are trademarks of Amazon.com, Inc., or its affiliates.